Danigral - 4 out of 5. 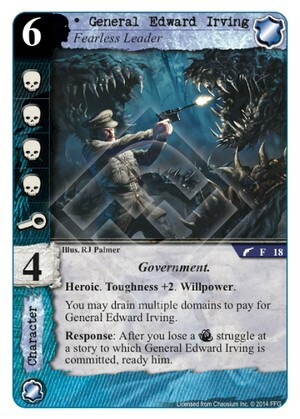 Another card that is better for Yog or Shub, but will work in Agency. It might be worth pondering if you need to have a resource match on each domain you use to pay for him, or only one. In any case, this multiple domain mechanic is cool and again rewards having extra domains. Like Grete, this guy is a powerhouse that can take on a story by himself. mnBroncos - 4 out of 5. Again only going to see play in the Lt. Wilson deck most likely, but in that deck this guy is as much as of a finisher as I have ever seen. You can send this guy alone to any story for success. He will win the combat and you even want to lose the terror because he can’t go insane and it readies him. I really want to throw this Government deck together. Obtuse - 3 out of 5. Another big Agency body this time with the new ability of being able to pay for him with multiple domains, making him playable early if you’re willing to invest. Again pairs nicely with the LT, but could see use outside a deck not making use of him. Kamacausey - 4 out of 5. Yes, this guy as well as the other expensive characters that you can drain multiple domains to play bite it to rite of the silver gate, but so what? This guy can single handily wreck your opponents day if left unanswered. He does a great job of getting around the agency's weakness of being able to ready and there are very few other characters that can hang with him in combat. He is a good finisher for literally any agency deck. People seem to only be considering the multiple domain pay characters in a control deck but rush decks can make use of these guys as we'll and can put them to good use. livingend - 3 out of 5. Okay, three things about the new “drain multiple domains” mechanic upfront. First of all, a reminder that large dudes are good with Shocking Transformation (duh-doy). Secondly, draining all of your domains to play one card instead of two or more cards is intrinsic card advantage. Obviously it’s not completely clear-cut because removal exists, but you should still keep it in mind when you evaluate these cards. Thirdly, for the purposes of playing a “drain multiple domains” card Eldritch Nexus basically becomes Feed Her Young. Same goes for any other way to gain domains with one resource attached to them. So, what about General Irving? Well, he dodges most forms of removal with skill 4 and toughness to boot. However, losing him to a Rite of the Silver Gate or, even worse, Stygian Eye is a tempo swing of daunting proportions that is gonna be difficult to bounce back from. All in all a solid character, but not with enough upside for most decks to be worth the sizeable risk. Verdict: 1 or 2 copies in the mono-Agency government deck and that’s about it. WWDrakey & Ire - 3 out of 5. Now that's a lot of combat icons. And those other stats ain't half bad either. Also, the ability will mean your opponent has the options of letting something go unopposed, or letting him ready back up. Using all of your domains on dropping him though... seems way too risky. So, most likely will only be seen in dedicated Government decks. Is there a ruling on the drain multiple domain cards yet, do you have to make a faction match on every domain or just the first? Going off some of the analysis above, IMO, draining all of your domains to play the General is no riskier than going 4-1-1 with your resources to play The Captain on turn 3 (as I did once, and lost him to Stygian Eye on the next turn). It's also no riskier than playing the newest version of Shub-Niggurath, crippling your biggest domain in the process, only to have the board cleared by a Plague Stone. It's also no riskier than playing a bunch of Day cards, only to lose them all to a single Night card entering play. IMO, if you're worried about every Stygian Eye that might come along, then General Edward Irving wasn't designed for you anyway. Look at the art for this card - does he look like he's worried about anything other than smashing face? If The Foundation is a 5 out of 5 (which it certainly is) then the General is a 5 out of 5 (which he should be). Different reason, yes, but just as valid and effective a reason as The Foundation. Not advocating playing recklessly, but also advocating not playing timidly. I think the guys above are over-thinking this one. In a faction that can struggle to go on the offensive for fear of being left completely defenseless on the opponent's turn, Irving provides a welcome beat stick who can contend for stories by himself. Should be a 5 out of 5.